this isn't about votes or any of that...I just don't want to put in the time if nobody has feedback ( good or bad) or can contribute to the ideas....so we'll keep it to just a chart for Thursdays trade.....well compare these levels in the morning..two days have created some volume at 45.50 so we need to be aware of that. Bruce what do you use to time your entries? Do you just look for a level to hold and try for the best possible price or do you have a standard signal you use? Bruce you have a lot of followers. May I suggest that you make your videos on occasion as there are many past ones people can watch. Why not just post the levels that you are looking at for the day. I think that would please all. Thanks Bruce, recently I have been trying to read the footprint charts, but to be honest a systematic entry eludes me at this point. It is too much a leap of faith at support and resistance that I wish I could refine much better. for me, I am grateful that it wasn't a big loser of a day.....and that is saying a lot as a fader on a trend day ...LOL! I agree ...that's when it becomes real important to see what happened with good old fashioned price action.......it can make a big tail or any large single print area a bit more manageable...also a great question to also ask your self is " are we able to hold in or out of value from previous days ? 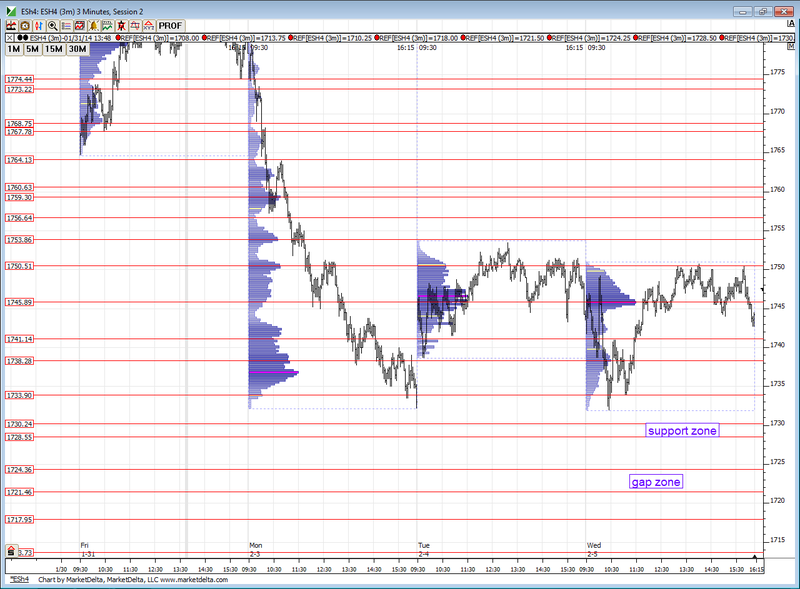 "...the time Value area high from monday was 59.50...so blowing through there and leaving a single print behind is sending a message.....which is always easier to see in hindsight...but might help if you trade outside the first 90 minutes etc..
thx for clarifying Bruce, those profile tails still baffle me somewhat.